Among the dizzying variety of stuffed pastas in the Italian repertoire, perhaps none—with the exception of ravioli—is more famous than tortellini. These ring-shaped bits of bliss are ambassadors of Italian cuisine abroad and these days they (or aberrant facsimiles) can be found on the shelves of almost any supermarket. Within Italy, they are practically synonymous with the region of Emilia-Romagna and more specifically with the cities of Bologna and Modena. And tortellini (along with their close cousin cappelletti) served in capon broth, are a fixture on Christmas Day dinner tables in central and northern Italy. As regular readers of this blog will know, I usually like to stress how easy most of the dishes I feature here are to make. This is one exception. While the recipe is fairly simple, to be perfectly honest, homemade tortellini are not easy. The process of forming these little pasta rings—folding little squares of dough in half over just a dot of stuffing and twirling them around your index finger—is no mean task for the beginner. It helps to have smaller hands and good fine motor skills so, although it may sound sexist, this is a dish more easily made by women than men. But that doesn’t keep me from trying, nor should it you, man or woman: the pay off really is worth it. The “tortellini” you can buy in stores (outside Italy) simply do not do this wonder justice—the pasta is typically too thick and tough, the stuffing cheapened by “filler”, among other travesties. And like anything else, practice makes perfect. A practiced tortellini maker can turn them out with amazing speed. Now add the mortadella and prosciutto to the food processor and process using the pulse function until you have a finely minced and fairly homogenous mixture. Add egg, grated cheese and nutmeg, then let it process until you have a very fine paste. The mixture should be quite dense and almost complete dry. If it is either a bit loose or a bit wet, add more cheese (or, if no one is looking, some breadcrumbs, but not too much). Taste for seasoning; the mixture should be very savory—if not, add more salt. Step 2: Now make your fresh pasta, following the master recipe. You want to roll out the pasta into thin sheets. Since you will fold the pasta twice, your tortellini will be unpleasantly chewy if the pasta is not rolled out thin enough. On the other hand, if you roll it out too thinly, it will be impossible to work with, so shoot for a happy medium. On my KitchenAid pasta attachment, I find that ending with the 5 setting works well. Step 3: Cut the pasta into squares and add the stuffing. Take a sheet of pasta and lay it out on a clean, flat, lightly floured surface. Cut the sheet into small squares, about 3-4cm (1 to 1-1/2 inches) wide. (Since I have large hands, I tend to make them on the large side of this range—but if you make them too large, you will have tortelloni, not tortellini! Now take your stuffing and place a small dot of it in the middle of each square. (You should use just a tiny bit or the filling will overflow in the course of the next step!) Some recipes will say to use a 1/4 teaspoon per, but for me a measurement like that is practically meaningless and, in any event, if you actually try to measure each bit of stuffing, you’ll be at it all day. When in doubt, use less than you think you need. Step 4: Form each tortellino by folding each square into triangles, taking one end and pulling it over the stuffing to touch the other end. Don’t try to line up the points exactly. They should be ever so slightly askew to give the tortellino its classic look. (And, in any event, it would be practically impossible to do otherwise.) Now take the two points at the ‘base’ of the triangle and twirl them around your index finger, attaching them on the other side of your finger to form a kind of ring. As you form each tortellino, place it on a dry towel, preferably one that has been draped over a baking rack, which allows for even air-flow above and below. The tortellini are now ready to cook. You can keep them out for a good while until you want to cook them. If you make them ahead, let them become dry to the touch and either refrigerate or freeze them until you want to use them. Don’t defrost them, however, or they will become gooey; just drop them in boiling water. Step 5: Cooking. Boil the tortellini in well-salted water (or, even better, in broth) until done. You don’t want them al dente in the manner of pasta secca. They should be tender without being mushy, either. The time it takes will vary wildly according to how long they have been drying, but in no event should it take longer than a few minutes. Freshly made tortellini will be done in about a minute or two. Serve immediately either in broth (the most classic method) or with a sauce (see Notes below). The stuffing recipe given here is a somewhat modified version of the “official” recipe established by the Dotta Confraternita del Tortellino, or “Learned Order of the Tortellino”. (You can find the original here.) The official recipe includes equal amounts of pork loin, mortadella and prosciutto and half again as much of parmesan, and specifies you should add even more parmesan if it has not been aged for at least three years. These proportions make for an even richer and more savory stuffing. But given the exorbitant price of these items, I’ve reduced the proportions of cured meats and cheese in relation to the pork loin, with perfectly delicious results, while saving on cost. The Confraternita also tells you to marinate the pork loin for two days before cooking it and to let the stuffing rest in the fridge for at least an additional day for the flavors to meld. If you have the time, I am sure these extra steps make the stuffing even better, but I usually marinate for no more than an hour and don’t necessarily make the stuffing ahead—and it still tastes wonderful. Many modern recipes reduce the amount of cured meats, as I have done here, eliminate the marination of the pork loin entirely, and call for a mixture of pork and chicken or turkey breast, rather than pork alone, in a 2:1 or 1:1 ratio, which I imagine lightens the mixture. These days, you will find tortellini stuffed with all manner of things. But real McCoys are made with the pork stuffing given here. The other kinds are the brainchildren of food marketeers. Sadly, in most stores here in the US the only kind of tortellini you aren’t likely to find are the real ones… Another more reason to make these babies at home. The most classic way to serve tortellini is in brodo, or in homemade broth. That way you really can enjoy the subtle flavors of the stuffing without distraction. But, for me, tortellini in panna, made with a sauce of butter, cream and grated parmesan cheese reduced until syrupy, is a very close second choice. Whatever you do, however, avoid travesties like tortellini with pesto (the pesto would completely overwhelm and clash with the taste of the stuffing) and—even worse‚ tortellini “salad”. Whoever thought of the latter monstrosity should be strung up. Tortellini are the most famous of a number of similar stuffed pastas from the Emilia-Romagna region of Italy, which is justly famous for its stuffed pastas and for fresh pasta generally. As mentioned, there are tortelloni, larger versions of tortellini and usually stuffed with ricotta cheese and leafy vegetables rather than meat and most often served with a butter and sage sauce. (They are too big for serving in broth.) Tortelli are square or round stuffed pastas, much like ravioli, but typically stuffed with pumpkin (see my recipe for tortelli di zucca). (Confusingly, the name tortelloni can also described a square stuffed pasta.) 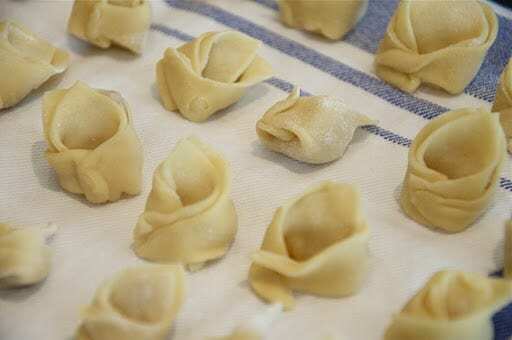 Cappelletti, or little hats, is similar in shape to and slightly larger than tortellini (made from 2 inch squares of pasta) and stuffed with a mixture of ricotta, capon breast, eggs and grated parmesan cheese, and laced with the ever-present scraping of nutmeg. There are several stories about the origins of tortellini, all of which point to Modena as their place of birth. According to one, obviously apochryphal story, the tortellino was invented by an innkeeper in Castelfranco Emilia (near Modena) who was inspired by the navel of Lucrezia Borgia, who he spied through the keyhole of the door of her bedroom. Another separate but similar story has the innkeeper hosting none other than the goddess Venus and being inspired by her navel, again peeking through the keyhole of her bedroom, where she was staying with the god Jupiter after a night of debauchery. Perhaps a bit more believable, tortellini are also said to be an homage to the turtle-shaped roofs of 17th-century buildings in Modena. To make the stuffing, cut the pork into smallish cubes and mix with a finely minced battuto of the garlic and rosemary, a generous salt and pepper. Let the pork marinate for at least a couple of hours. Sauté the pork in butter over gentle heat. When the pork is cooked through, transfer it to a food processor, leaving the butter and bits of garlic and rosemary behind. Add the mortadella and prosciutto to the food processor and process using the pulse function until you have a finely minced and fairly homogenous mixture. Add egg, grated cheese and nutmeg, then let it process until you have a very fine paste. The mixture should be quite dense and almost complete dry. If it is either a bit loose or a bit wet, add more cheese or some breadcrumbs. Taste for seasoning; the mixture should be very savory—if not, add more salt. Cut the pasta into squares and add the stuffing. Take a sheet of pasta and lay it out on a clean, flat, lightly floured surface. Cut the sheet into small squares, about 3-4cm (1 to 1-1/2 inches) wide. Now take your stuffing and place a small dot of it in the middle of each square. Some recipes will say to use a 1/4 teaspoon per, but for me a measurement like that is practically meaningless and, in any event, if you actually try to measure each bit of stuffing, you'll be at it all day. When in doubt, use less than you think you need. 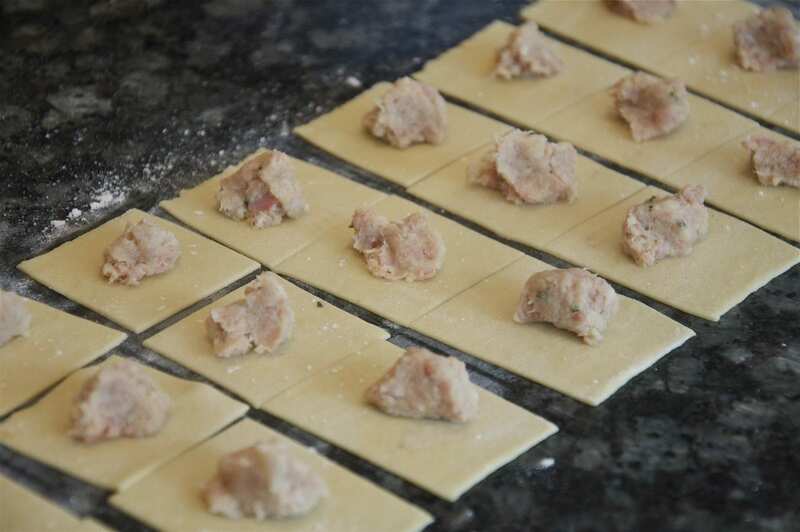 Form each tortellino by folding each square into triangles, taking one end and pulling it over the stuffing to touch the other end. Don't try to line up the points exactly. They should be ever so slightly askew to give the tortellino its classic look. Now take the two points at the 'base' of the triangle and twirl them around your index finger, attaching them on the other side of your finger to form a kind of ring. As you form each tortellino, place it on a dry towel, preferably one that has been draped over a baking rack, which allows for even air-flow above and below. Cooking. Boil the tortellini in well-salted water (or, even better, in broth) until done. You don't want them al dente in the manner of pasta secca. They should be tender without being mushy, either. The time it takes will vary wildly according to how long they have been drying, but in no event should it take longer than a few minutes. Serve immediately either in broth or with a sauce. Thank you so much for the conversion to ounces! I am freshly back from a trip to Bologna and eager to try my hand at authentic tortellini. Thrilled to have found your fabulous website. Already learning so much. Grazie mille! Curious if you know the conversions from grams into ounces? thank you for this recipe! am eager to try to make real tortellini bolognesi! Frank, have you ever made this with chicken instead of pork? I was going to make a chicken broth and use the dark meat instead of the pork in these. What do you think? I’ve never made tortellini with anything but pork but why not go ahead and use chicken—or turkey. I see no reason why not to try it. Thanks for this! I’m going to make this in a few weeks. I don’t have capon broth. Can I just use chicken broth instead? Sure, chicken broth would be fine. It’s what I always use! My mother and I just made 2000 tortellini for Thanksgiving dinner. We make also make them for Christmas and Easter as well. My cousin and aunt also made 3600 . . . we have a huge Italian family that MUST have tortellini in brodo for every holiday . . . and nothing but home-made. We also use mortadella and prosciutto in our filling as well. We always have a competition to see who can make the tiniest, tiniest tortellini! I use my pinky finger to twist them! Having just returned from my family in Emilia-Romagna, we were delighted to enjoy tortellini in Italy too! Stop by my blog sometime, do a search, and you can compare recipes! That’s amazing, Roz! You must be a real master at tortellini. I’ll be stopping by your blog real soon. Yum! This looks sooo good! I love making pasta but have never tried tortellini. Definitely changing that soon. I never tried to make tortellini and it is particularly intimidating to think about making them in large batches… I admire you very much! They look absolutely perfect to me Frank. Many thanks, friends, for your kind comments. And tanti auguri di buon Natale!!! @Paolo: Many thanks for the mention. I am honored! @Sandra M.: Quindi ho fatto un buon lavoro.. :=) Tante grazie! Well done Frank a really good explanation. I'm not sure this close to Christmas I will have the time to make them but later I certainly will. You are right, Frank, I personally would never dare to make tortellini 🙂 I can make more simple ravioli, but -so far- shaping up tortellini has been too intimidating. It'll be one of my new year's resolution! Wonderful recipe and article, as usual. Wow – that looks absolutely incredible! I LOVE tortellini in a stock/broth! Frank, thank you for this lovely post sharing traditions of Italian cooking methods wrapped in your clear and concise directives. I'll be spending more time looking at your other terrific entries. Happy holidays to you & yours! Da modenese D.O.C. ti mando un sorriso. You're so right about the difficulty of making these and needing small, dexterous fingers. But you seemed to have mastered it perfectly. Thanks for the details and the reference to the original recipe. There is so much quick and dirty blogging about Italian cooking that I feel lucky to have found you.